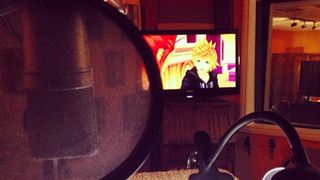 Jesse McCartney, the voice actor behind Kingdom Hearts's Roxas, is working on a new game in the series, if you believe his Instagram account. McCartney posted a teaser today saying he was recording "the next chapter" in the action-RPG series, which could very well be Kingdom Hearts 1.5, the HD remix announced in Japan last fall. Kingdom Hearts 1.5 is a PS3 "remix" that includes high-def versions of both the first Kingdom Hearts and Kingdom Hearts Re: Chain of Memories. It also has videos from the DS game Kingdom Hearts 358/2—the scene McCartney instagrammed appears to be from those. If the videos are getting English voice acting, the game's probably coming here. Presumably McCartney isn't talking about Kingdom Hearts 3, which hasn't been officially announced for any platform yet, or some sort of other unannounced title in the series. Presumably he also isn't just making things up to tease his fans, because that would be really mean. I've reached out to Square Enix for confirmation and will update should they get back to us.